If you’re a loyal ForkliftCertification.com blog reader, you’re probably a forklift driver. And if you’re reading our blog for the first time, you may be considering a career as a forklift driver. 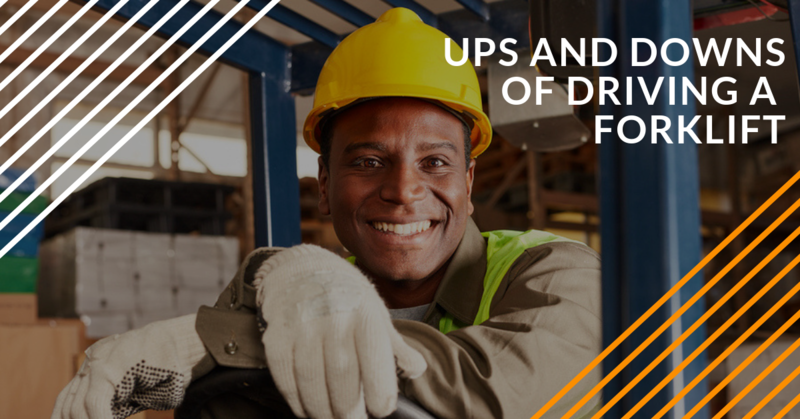 Whether you’re a veteran or would-be rookie, keep in mind of the ups and downs of forklift driving. Just like every other job, a forklift driver has its share of pros and cons, so we listed a few below. Some are surprising, some are obvious, but all are part of a forklift driver’s day-to-day work environment. Through all the ups and downs of forklift driving, one thing remains true: with proper training and certification from ForkliftCertification.com, both employers and employees will enjoy a safer, more productive warehouse, dockyard, distribution center, terminal, construction site, and a thousand other places where forklifts are used. Pro: as a forklift driver, you can lift more than any other profession – even Olympic weightlifters and professional football players. Con: forklifts are usually shared. And the guy who ate the garlic salami sandwich on the previous shift used your lift. Air freshener, anyone? Pro: name another job where you can drive around all day, see cool things, make the customer happy and get a good wage. Con: as a blue-collar worker, expect that collar (and the rest of your gear) to experience sweltering heat, chilling cold and pretty much every temp in between. Hey, this isn’t some bean-counter or paper-pushing job – this is forklift driving! Pro: getting comprehensive OSHA compliant training is easier and more affordable than you thought. For employers, compliance is mandatory. ForkliftCertification.com has the courses and safety support you need to increase safety with your forklift fleet! Con: without safety training, your company could experience severe OSHA fines. Thankfully, the training you need is only a click away. Pro: the ladies dig a forklift driver. It’s a scientifically proven fact. Con: it’s also a scientifically proven fact that, as a forklift driver, you’re still not as cool as a Formula One racecar driver. But then again, who is? Pro: your experience as a warehouse forklift driver prepares you for other careers. From leadership experience to inventory management, working as a warehouse forklift driver just might pave the way toward a well-paying career in supply chain management! Want to Keep Safety & Productivity Up, While Keeping Accidents & Injuries Down? Sign up With FLC Today! Streamlined OSHA compliance. Every forklift driver working in the U.S. needs to be trained. What’s the best way to get your employees (or yourself) compliant? FLC’s training courses, plain and simple. Online convenience. Our forklift certification courses offer the flexibility and 24/7/365 convenience that’s hard to beat. No expensive off-site seminars. No schedule-wrecking 3rd party instruction. With FLC, we empower employers and employees alike in their forklift certification! Affordable prices. All of our training offerings feature value-added pricing to give you the best bang for your buck. Think about the costs of non-compliance: if your company has a forklift accident, an OSHA audit or investigation could result in expensive fines and penalties. You can’t afford to NOT train your employees with FLC! There aren’t any “downs” with forklift certification training. Forkliftcertification.com offers 3 forklift training programs: the Forklift Training Kit, Train a Trainer class and Bundle Training Package. Each class can be taken online, and we jam-pack all of our courses with relevant OSHA-compliant material, so you’re always up to speed (no, not Formula One speed, but you get the idea). Regular workers, bossy supervisors, even the guy in the office who’s responsible for HR training – anyone can enjoy our online courses at the click of a mouse. Training Kit – one of our most popular forklift certification classes shows basic and advanced operating techniques, OSHA safety guidelines, and much more! Train a Trainer – if your company needs a Certified Forklift Safety Expert (and who doesn’t? ), try this comprehensive training package. Bundle Package – it’s hard to pick between two outstanding OSHA compliant training courses, so we also offer both the Training Kit and Train a Trainer courses at a special discounted rate. Harley-Davidson, Fuji Film, Coca-Cola and Snap-On tools use FLC for their lift training requirements, so why shouldn’t you? Check out our contact page or give us a call at (888) 278-8896 to learn more about how FLC can assist you today. Thanks for reading the ForkliftCertification.com blog!